Objective: To evaluate the efficacy and side effects of oral pilocarpine for the treatment of ocular symptoms in patients with primary Sjögren’s syndrome (SS). Methods: A 12 week, single centre, randomised controlled study was performed. Twenty nine patients were randomly assigned to receive oral pilocarpine (5 mg twice a day), 28 only artificial tears, and 28 inferior puncta occlusion. Patients receiving oral pilocarpine and those with inferior puncta occlusion also received artificial tears. Patients were evaluated at baseline and throughout the study for their subjective global assessment of dry eyes and for their objective assessment of dry eyes (Schirmer’s-I test, rose bengal test, and imprint test). Results: Patients taking oral pilocarpine had significant improvement in subjective global assessment of dry eyes, as was evaluated by improvement of >55 mm on a visual analogue scale (VAS) for responses to the eye questionnaire, compared with patients treated with artificial tears (p<0.001) and those with inferior puncta occlusion (p<0.05). Furthermore, patients receiving oral pilocarpine also showed greater objective improvement, as measured by the rose bengal test (p<0.05), while Schirmer’s-I test showed no differences between the treated groups. Commonly reported adverse events were headache, increased sweating, nausea, and vomiting in the pilocarpine group, while one patient in the inferior puncta occlusion group had blepharitis and was withdrawn from the study. Conclusion: 10 mg of pilocarpine daily given to patients with SS for 12 weeks had a beneficial effect on subjective eye symptoms, as evaluated by improvement >55 mm on a VAS. Additionally, an improvement of rose bengal staining was noted, but an increase in tear production, as measured by the Schirmer-I test, was not substantiated. Sjögren’s syndrome (SS) is a chronic autoimmune disease characterised by focal or diffuse lymphocytic infiltration of the exocrine glands, leading to mucosal dryness expressed mainly as dry eyes and dry mouth.1,2 The principal ocular complaint is dry eyes with a sandy or gritty feeling under the eyelids. Other symptoms include a burning sensation, decreased tear production, redness, itching, and photosensitivity. These symptoms are attributed to the destruction of corneal and bulbar conjuctival epithelium, defined as keratoconjunctivitis sicca (KCS).1,2 Ocular complications are episcleritis, keratitis, bacterial or viral infections, as well as corneal ulcers. Systemic treatment of patients with SS has no beneficial effects on dry eyes. Thus, the mainstay of the treatment of KCS is to replace deficient tears with artificial tears.3,4 Other approaches include attempts to decrease the drainage of lachrymal tears through the puncta and nosolachrymal ducts by placing occlusive elements in the inferior or superior puncta, or both.5 Recently, it has been suggested that pilocarpine, a cholinergic parasympatheticomimetic agonist given orally, improves sicca symptoms in patients with SS.6 In this study we investigated the efficacy and side effects of oral pilocarpine for the ocular symptoms in patients with primary SS. Eighty five female patients with SS who fulfilled the preliminary European criteria for SS were included in the study.7 The patients were randomly assigned to one of the three treatment groups for a period of 12 weeks. Patients were randomised according to a computer generated schedule. Thus, 29 patients were assigned to receive oral pilocarpine (5 mg twice a day; Salagen tables, Novartis Pharma Inc), 28 were assigned to be treated with artificial tears only and, finally, 28 patients were assigned to be treated with lachrymal puncta occlusion (fig 1). 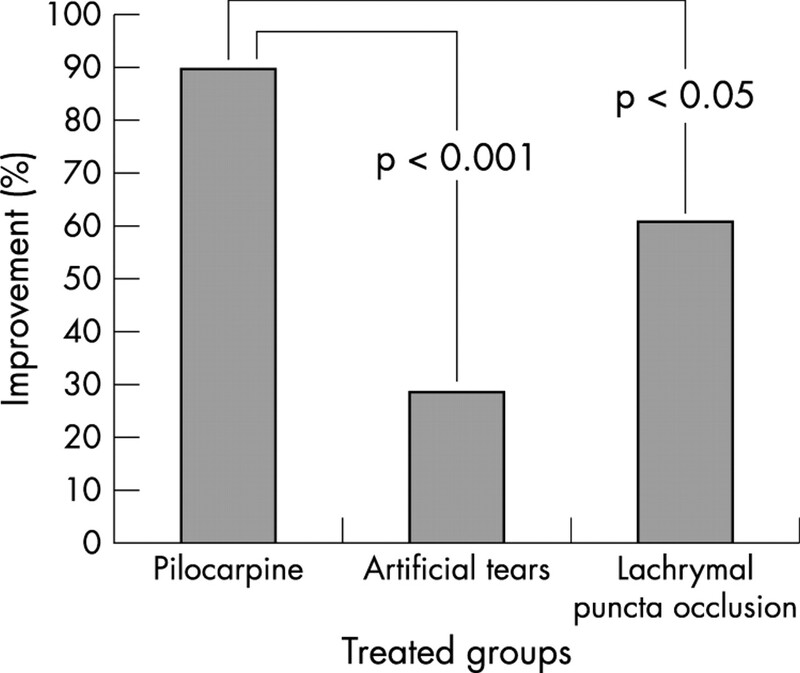 Patients in the pilocarpine group and those with the lachrymal puncta occlusion also received artificial tears. Flow of patients and trial profile. There is no single, recognised test for the diagnosis of KCS. Thus, various tests are used in the following order: a dry eyes questionnaire, Schirmer’s-I test, the rose bengal test, the break up time test, the fluorophotometer method and, finally, the imprint test. In our study all patients responded to a subjective questionnaire for dry eyes.7 Schirmer’s-I test without local anaesthesia and rose bengal staining, after slit lamp eye examination, were performed. In addition, conjuctival impression cytology (imprint test) was performed on all patients.8 Changes from baseline in ocular symptoms were assessed on a 100 mm visual analogue scale (VAS). The VAS score was defined as an improvement of >55 mm for responses to the eye questionnaire. The clinical examination and the eye questionnaire were done by the same investigator (NT). Eye examination, Schirmer’s-I test, and rose bengal staining were all performed by another investigator (GK), who was unaware of the treatment allocation. Furthermore, the imprint test was done by another eye doctor (CAP) who was also unaware of the treatment arms and the results of Schirmer’s-I and rose bengal tests. Improvement of the imprint test was defined as an increase in the cytoplasm/nucleus ratio of the epithelial cells and by the increased number of goblet cells.8 The occlusion of the puncta was also performed by the same eye investigator (VE). More specifically, the inferior puncta of both eyes was occluded by the placing of collagen plugs for seven days, followed by permanent collagen plugs for the rest of the treatment (Collagen Plugs, Lacrimedics Inc). The primary efficacy end point was the subjective assessment of a specific questionnaire using a series of VAS. A secondary efficacy end point was the objective measurement of tear flow using Schirmer’s-I test. An additional secondary efficacy end point was the objective measurement of the condition of the conjuctival epithelial cells using rose bengal and imprint tests. Patients were followed up every week for the first month and every month thereafter. The same investigational tests were repeated at the end of the study as an objective measure of treatment efficacy, and patients were also asked to respond to the eye questionnaire for subjective changes in their symptoms. Patients with diabetes mellitus, renal failure, heart and gastrointestinal diseases, multiple sclerosis, and ophthalmological disorders other than SS were excluded from the study. The estimation of the power of the study was based on a subjective perception of improvement. Preliminary calculations were based on an examination of the first 10 patients included in each group. Assuming a 90% response rate in the group receiving pilocarpine and a 30% response rate in the group receiving artificial tears, 25 people for each treatment would result in a power of 90% for this comparison. The subjective perception of improvement was compared between the groups using a two sided χ2 test, with Yates’s correction when appropriate. Differences in the results of the clinical examination were compared among groups using the Kruskal-Wallis test for the overall comparison and the Wilcoxon test for pairwise comparisons. No significant differences in mean age, mean disease duration, glandular and extraglandular manifestations, or autoantibody profile were found between the three groups (table 1). The subjective ocular improvement was more prominent, with significant difference in the pilocarpine treated group, as compared with the patients treated with artificial tears (p<0.001) and those treated with lachrymal puncta occlusion (p<0.05) (fig 2). For the objective measurement for dry eyes, Schirmer’s-I test, no significant difference was found between the three treated groups. Patients treated with pilocarpine had an improvement in the rose bengal test as compared with other treated groups (p<0.05) (table 2). Subjective improvement of occular symptoms in patients with primary SS. The wetting of the conjuctival ocular surface, as evaluated by the imprint test, was effective in patients treated with pilocarpine. More specifically, patients treated with pilocarpine presented a decrease in the cytoplasm/nucleus ratio of the epithelial cells and an increase in the number of goblet cells compared with the other treated groups; this was not statistically significant (table 2). Side effects were as follows: four patients had mild headache, of whom three also presented with nausea, vomiting, and sweating. None of these patients discontinued the study because of side effects. However, one patient of the lachrymal puncta occlusion group discontinued the study because of a local infection of the right eye and one more patient from the same group was lost to follow up (fig 1). Pilocarpine treatment in patients with SS usually starts with 5 mg at night for a few days, then 5 mg twice daily, morning and night for a week, and then, if the patient does not respond, the dose is increased to 15 or 20 mg a day. This is done specifically to help avoid sweating and other side effects. In some cases (10%) the dose is increased to 30 mg a day.23 In this study we used oral pilocarpine 5 mg twice daily in order, firstly, to avoid side effects because some side effects are dose dependent, and, secondly, to encourage better compliance of the patients because many patients with SS may take multiple drugs such as non-steroidal anti-inflammatory drugs, proton pump inhibitors, and calcium supplements. In conclusion, according to our results, oral pilocarpine seems to have a beneficial effect on subjective eye symptoms, as was evaluated by an improvement of >55 mm on the VAS for responses to the eye questionnaire and by improvement of the rose bengal test. Large multicentre studies with a large number of patients are needed to validate our results. Talal N, Moutsopoulos HM, Kassan SS., eds. Sjögren’s syndrome: clinical and immunological aspects. Berlin: Springer, 1987. Moutsopoulos HM. Sjögren’s syndrome: autoimmune epithelitis. Clin Immunol Immunopathol1994;72:162–5. Bell M, Askari A, Bookman A, Frydrych S, Lamont J, McComb J, et al. Sjögren’s syndrome: a critical review of clinical management. J Rheumatol1999;26:2051–61. Fox R. Treatment of Sjögren’s syndrome. In: Weinblatt ME, ed. Therapy of rheumatoid disease. Philadelphia: Saunders, 1999:66–77. Balaram M, Schaumberg DA, Dana MR. Efficacy and tolerability outcomes after punctal occlusion with silicone plugs in dry eye syndrome. Am J Ophthalmol2001;131:30–6. Wiseman LR, Faulds D. Oral pilocarpine: a review of its pharmacological properties and clinical potential in xerostomia. Drugs1995;49:143–55. Vitali C, Bombardieri S, Jonsson R, Moutsopoulos HM, Alexander EL, Carsons SE, et al. Classification criteria for Sjogren’s syndrome: a revised version of the European criteria proposed by the American-European Consensus Group. Ann Rheum Dis2002;61:554–8. de Rojas MV, Rodriguez MT, Ces Blanco JA, Salorio MS. Impression cytology in patients with keratoconjunctivitis sicca. Cytopathology1993;4:347–55. Waterman SA, Gordon TP, Rischmueller M. Inhibitory effects of muscarinic receptor autoantibodies on parasympathetic neurotrasmission in Sjogren’s syndrome. Arthritis Rheum2000;43:1647–54. Fox RI, Stern M. Sjögren’s syndrome: mechanisms of pathogenesis involve interaction of immune and neurosecretory systems. Scand J Rheumatol Supple2002;116:3–13. Fox RI, Chan E, Benton L, Fong S, Friedlaender M, Howell FV. Treatment for primary Sjögren’s syndrome with hydroxychloroquine. Am J Med1988;85:62–7. Drosos AA, Skopouli FN, Costopoulos JS, Papadimitriou CS, Moutsopoulos HM. Cyclosporin A (CyA) in primary Sjögren’s syndrome: a double blind study. Ann Rheum Dis1986;45:732–5. Skopouli FN, Jagiello P, Tsifetaki N, Moutsopoulos HM. Methotrexate in primary Sjögren’s syndrome. Clin Exp Rheumatol1996;14:555–8. Price EJ, Rigby SP, Clancy U, Venables PJ. A double blind placebo controlled trial of azathioprine in the treatment of primary Sjögren’s syndrome. J Rheumatol1998;25:896–9. Hingorani M, Moodaley L, Calder VL, Buckley RJ, Lightman S. A randomized, placebo-controlled trial of topical cyclosporin A in steroid-dependent atopic keratocojunctivitis. Ophthalmology1998;105:1715–20. Kunert KS, Tisdale AS, Stern ME, Smith JA, Gipson IK. Analysis of topical cyclosporine treatment of patients with dry eye syndrome: effect on conjunctival lymphocytes. Arch Ophthalmol2000;118:1489–96. Ship JA, Fox PC, Michalek JE, Cummins MJ, Richards AB. Treatment of primary Sjögren’s syndrome with low-dose natural human interferon-alpha administered by the oral mucosal route: a phase II clinical trial. IFN Protocol Study Group. J Interferon Cytokine Res1999;19:943–51. Fox RI, Stern M, Michelson P. Update in Sjögren’s syndrome. Curr Opin Rheumatol2000;12:391–8. Masunaga H, Ogawa H, Uematsu Y, Tomizuka T, Yasuda H, Takeshita Y. Long-lasting salivation induced by a novel muscarinic receptor agonist SNI-2011 in rats and dogs. Eur J Pharmacol1997;339:1–9. Vivino FB, Al-Hashimi I, Khan Z, LeVeque FG, Salisbury PL 3rd, Tran-Johnson TK, et al. Pilocarpine tablets for the treatment of dry mouth and dry eye symptoms in patients with Sjögren’s syndrome: a randomized placebo-controlled, fixed-dose, multicenter trial. P92–01 Study Group. Arch Intern Med1999;159:174–81. Fox PC, Mandel ID. Effects of pilocarpine on salivary flow in patients with Sjögren’s syndrome. Oral Surg Oral Med Oral Pathol1992;74:315–18. Rhodus NL. Oral pilocarpine HC1 stimulates labial (minor) salivary gland flow in patients with Sjögren’s syndrome. Oral Dis1997;3:93–8. Vivino FB. 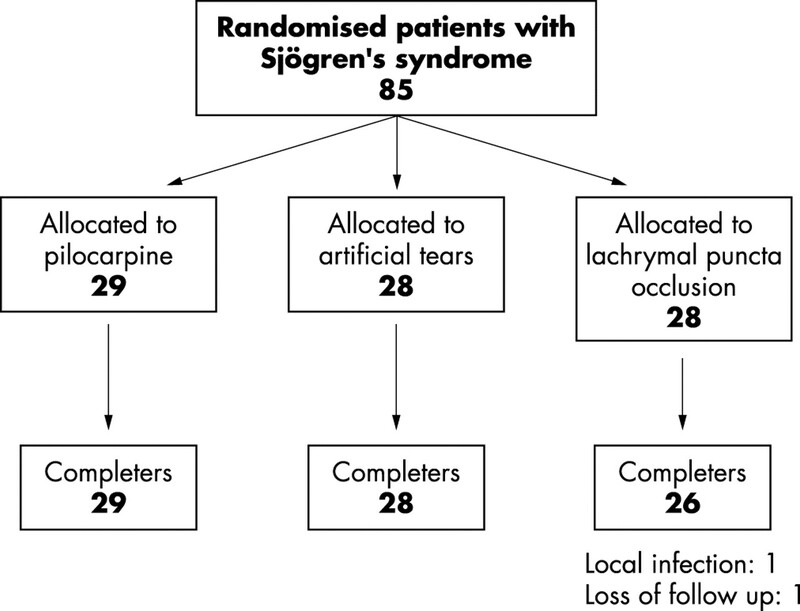 The treatment of Sjögren’s syndrome patients with pilocarpine tablets. Scand J Rheumatol2001;30 (suppl 115) :1–13. Petrone D, Condemi JJ, Fife R, Gluck O, Cohen S, Dalgin P. A double-blind randomized, placebo-controlled study of cevimeline in Sjögren’s syndrome patients with xerostomia and keratoconjunctivitis sicca. Arthritis Rheum2002;46:748–54.